Care to join me and Kathleen from Boarding in My Forties? I think you do. After all, this is going to be a fun one. Recently, I was mulling over how to include more Stephen King into my reading. As you know, I've become a fan of his work recently by reading 'Salem's Lot, The Colorado Kid, and 11/22/63 over the past two months, and I was shocked. Yes, he writes horror, but he also writes speculative fiction, time travel, and basically does one hell of a job creating characters, situations, and successfully communicating to the reader genuine human interactions that people have. So when I read a post of Kathleen's, it stuck with me. She wanted to eventually read all of King's books and it got me thinking about maybe hosting a challenge. A year long one. Thus, The Stephen King Project was born! After some tweets and emails, here is the overview! Anyone can join. But you should have a blog OR an account with Goodreads, Shelfari, etc., so you can write your reviews and we can visit via the link at The Stephen King Project. 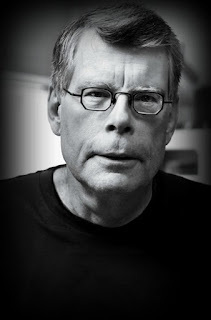 The Project will be hosted at The Stephen King Project review site. Participants should link their reviews to the Linky there. You can mix and match but you should have more books than films in your end-of-year total tally. Write an announcement post on your blog. You don't have to put a list of books together in your announcement post. Or you can, whatever works for you. Use one of the blog buttons below in your announcement post. Enter the link to your announcement post at The Stephen King Project Announcement Post (not the Project Overview post). Every time you write a review, enter the link to it for the appropriate month at the review site. (On the 1st of each month, a new entry will be posted at the review site, and you can link up your reviews there). At the end of each month, one participant from that month will be selected via random.org and will win a book from either Kathleen or I (or we may both have a book to give you). The book may or may not be King-related. At the end of the year, one participant from the year will win a $50 gift card! Feeding My Book Addiction is hosting a readalong for 11/22/63 in January. Click here to join it! 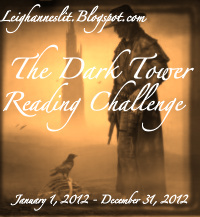 And Leighanne from Leighanne's Lit is hosting The Dark Tower Challenge! Go to her site to read more about this challenge, and you better believe I'm joining that one. I just did a quick post on the project! Thanks again for organizing everything for us. I'm excited and can't wait for others to join us! I'll be reading 11/22/63 with my book club! GREAT idea, Natalie! I commented on Kathleen's blog that I might not join officially right now, but I do want to read some King in the coming year. :) Good luck with the project! If my husband had a blog, he would be all over this challenge! I like King and hope to read both 11.22.63 and some of the Dark Tower series this year. I just saw this over at Kathleen's! You know I love my Uncle Stevie. I read just about everything he wrote when I was younger. I am about halfway through 11/22/63 right now, and have plans to also listen to Duma Key and re-read his short stories this year. While I am anti-challenge, I will be sure to link up with you all when I review these books! I need to try The Colorado Kid. I don't think I can take part right now but this definitely sounds like a cool challenge. This sounds like a fun project. I'm in! I'm not sure I can commit to more than three books, although I'd like to read six. Perhaps some audio will help get in those extra books. I'll write a post this week and link up. I read a lot of Stephen King's earlier books but not so much lately. I did read 11/22/63 and loved it. It reminded me why I liked his books so much. I've always said his writing is much more than horror. One of my favorite books is Four Past Midnight. It's four novellas but at a few hundred pages per story, they were like novels to me. Awesome, Natalie. :) I will be joining in, too! Tempting! You know how much I loved Lisey's Story and I'm sure I'm going to love 11/22/63 -- I might have to join in. I also rather love films based on King works -- they're so trashy and delicious! This is such a great challenge, and since I will be reading his latest soon, and perhaps one or two others, I am going to have to think about joining. It sounds like it's going to be an amazing challenge! Happy New Year, my friend! I also am excited that you may be able to join us for SIBA in the fall, and am looking forward to seeing you and getting the chance to hang out with you some more! I've been reading Stephen King since the mid 1970's. I think my favorite story is "The Stand", but I think the scariest is "Pet Semitary". Have fun reading! I vowed to do no more than 5 challenges but I knew someone would come along and upset the plan. Count me in - I'll write a post tomorrow. Good luck on this new challenge and all your goals (from your previous post)for 2012. I plan on simply enjoying reading and keeping in touch this year. This sounds like such fun! I hate to admit it but I'm yet to pick up a Stephen King novel *hides*... I vow to pick one up this year, though! I'm now following you too - I ADORE your blog theme. I read about this challenge earlier today on Naida's blog, the bookworm. I created a reading challenge, The Jodi Picoult Project, for a similar reason: to entice me to read more of her novels. But back to King! I do plan on reading It, sometime this year, and will then participate in this terrific challenge. Great buttons! Oh man is this tempting! I'm challenge free but my ONLY bookish plans for this year is to read The Stand. Might join as a King Novice. I just couldn't resist, I'm in! I'll at least be reading one Stephen King and I might try to get at least 3 in (if not more!). Thanks for doing this! What a great idea! I've never read any Stephen King, but I think I'll use this as an excuse to tackle 11/22/63. Natalie, may I submit a review I did a while ago, on my first book by Stephen King, Duma Key? I'd really love to hear what others think about this book, too! This is a great idea, thanks for putting it together. I just signed up at The Stephen King Project website. Awesome! I mean "$50 gift card" is great idea to make a post popular. No yahoo Answers.. I have read 2 Kings so far and I usually ends up with 4 or 5 King's books a year. I wish I could read 6...but I am a slow reader. Can I still submit my review of Carrie? both watched and read before April?